How do you, my fellow bloggies cope with this? I think it means the right side of your brain is more prominent. Out of curiosity, are you a left handed person? I know what you mean there, mine is dreadful unless I really concentrate, even then is drifts into spider scruff. I can do either, I just have to think about what I am doing. I’m the same, the best example of this being used in on the Nitendo DB Brain game when you have to do it quickly, then your actual rections become more prominent. I had no trouble with this. What does that mean?!? I have no right brain! Hard to say the colour. I want to say the word. Does that mean I’m left brain dominated? I think so… its fun to see people coping with this. Definitely. 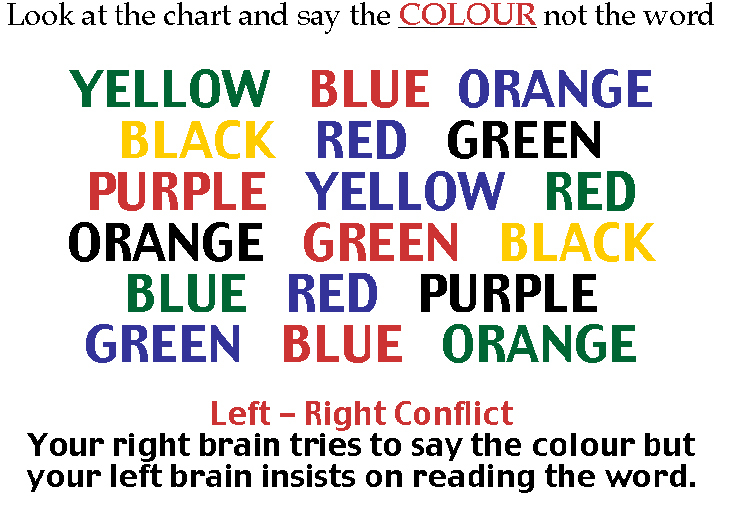 ..that wasnt my intention with the brain teasers… But its great to see.